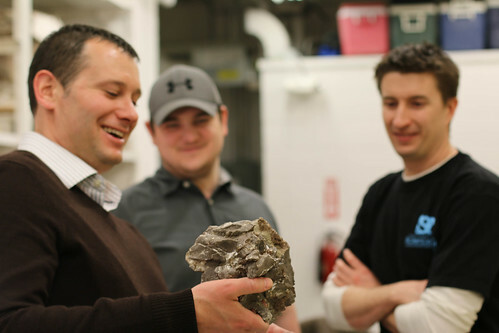 Matthew Lamanna, Ph.D, (center), shows various dinosaur fossils to students Michael Bowen (left) and Matthew Love. Ecology students Michael Bowen and Matthew Love recently shadowed a nationally-recognized dinosaur expert at the Carnegie Museum of Natural History in Pittsburgh, ranked one of the top five natural history museums in the country. Matthew Lamanna, Ph.D., assistant curator of vertebrate paleontology, guided the Point Park students through the museum and PaleoLab while discussing his research focusing on dinosaurs, birds and crocodilians living during the Cretaceous Period. "I loved dinosaurs growing up so it was really fun to see someone living that dream," remarked Bowen, a senior secondary education biological sciences major. Bowen and Love had the opportunity to hold rare dinosaur fossils more than 150 million years old. "I was a bit starstruck when he showed us the actual first-ever T-Rex bone found," said Bowen. "This shadow assignment was a once-in-a-lifetime experience." While at the museum, the students also shadowed Dan Pickering, PaleoLab manager and scientific preparator, and Joe Sawchak, scientific preparator. "Shadowing provides excellent networking opportunities for our students. I've had professionals offer students summer internships and take them on fossil digs," explained Matthew Opdyke, Ph.D., associate professor of environmental science, who teaches Ecology 235. Opdyke's ecology student Hana Jiraskova also recently shadowed a professional in the environmental sciences field - Emilie Rzotkiewicz, stewardship director for Allegheny Land Trust. "I learned about the company infrastructure of Allegheny Land Trust and met almost all of the staff in the Sewickley office. I enjoyed meeting new people, creating contacts and learning about workforce issues in Pittsburgh," said Jiraskova, a senior biology major with a minor in chemistry. Opdyke makes it a top priority for his students to observe and learn about opportunities in the natural sciences before graduating. "I want my students to not only be informed but excited about applying their education to a career field that really interests them," said Opdyke.